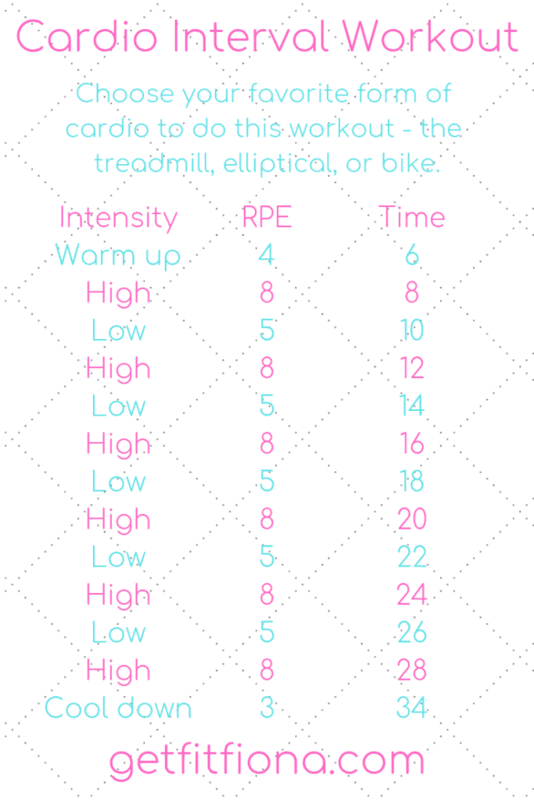 Today I’m sharing a cardio interval workout that you can do with any form of cardio. I don’t share a lot of cardio workouts here on GFF even though they’re my favorite to do at the gym. I figured that it was time to share another one. This cardio interval workout can be done on any piece of cardio equipment at the gym – the treadmill, elliptical, or bike. It includes a warm up and cool down in the 34 minutes, so it’s perfect if you’re short on time. How do you know how hard to work? That’s where Rate of Perceived Exertion (RPE) comes in. RPE is based on a scale of 1 to 10 – 1 be very light activity and 10 being working as hard as you possibly can. The warm up and cool downs will have the lowest RPE. The hardest that you’ll be working at during this workout is an 8. You should be able to work at a 1 indefinitely, while a 10 should only be sustainable for a short period of time. Below is a chart indicating how hard you should be working at each RPE. This scale should give you an idea of how hard you should be working at each stage of the workout. As mentioned above, manipulate one of the variables (speed, incline, or resistance) to get to the required RPE. It might take some practice at first to figure out how much to change the variable to get the required RPE, but you’ll get the hang of it before you know it. If you’re looking for more workouts to do, check out my workouts page. I have them divided up by category, so whatever you’re looking for, you’ll be able to find it there. What’s your favorite form of cardio? As always, talk to your doctor before beginning to workout. Honor your body and modify this workout for you.